This animated movie is worth the price of purchase on DVD or Blu-ray, because it’s one you’ll want to watch over and over. But you can’t go wrong with the upgrade to Blu-ray, because How To Train Your Dragon‘s digital animation looks impecable in high-definition. About a viking boy who goes against his father and the others in his clan and befriends dragons instead of attacking them, How to Train Your Dragon is one of those movies that has the WOW factor. Wow, that’s fun. Wow, that’s funny. Wow, let’s watch it again. And the Blu-ray presentation is wow too. The picture is sharp, colors bright and the family film sounds wonderful. It’s exactly what you’d expect from an animated movie, which translate beautifully in high-definition, better than live-action films. 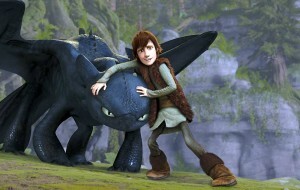 And with the animation in How To Train Your Dragon so compelling, the Blu-ray just offers enhancement. But, that’s not all that makes the Blu-ray package worth its price. DreamWorks Animation packed it with plenty of good special features. The whole family will enjoy answering a few questions to see which character they’re most like (I am apparently like Fishlegs), and kids will spend hours drawing the dragon Toothless after the how-to lesson from supervising animator Gabe Hordos. The whole family also will enjoy the new short film Legend of the BoneKnapper Dragon, featuring a new adventure with the same loveable characters, and the quick and funny scenes in “Race For the Gold in the Viking Winter Games,” a fun take on the Olympics. For older viewers, there’s a featurette on the casting of the movie’s voices (including footage of the actors recording and interviews with the likes of Jay Baruchel (The Sorcerer’s Apprentice) and Gerard Butler (The Bounty Hunter) about their roles), another featurette on the technical artistry of the film and another on bringing the book to life, including interviews with author Cressida Cowell . All are interesting, offering a look into the decisions that made the movie what it is. For those who like interaction while they watch, the Blu-ray offers three versions: a filmmakers’ commentary that’s probably too dry for young fans, but those interested in animation should have a listen; a fun pop-up trivia track offering additional details about the story; and the Animators Corner, with picture-in-picture storyboards, behind-the-scenes footage and interviews. All in all, with both the Blu-ray and a regular DVD in the set, How to Train Your Dragon is a keeper.